I have come up with a conclusion that for the future of (open) education Internet Archive and Wikidata are the two most important web services in the world. And not only for the open education, but also for the open web. Therefore, I think the Internet Archive and Wikidata are becoming the most important websites for the entire humanity. When people write about open education they often make reference to MOOC services, Khan Academy and MIT’s Open Courseware. Furthermore, they may include to the list TED talks and other online video lecture services. This seems to be the case especially with writers coming from the United States of America. Khan Academy’s interactive exercises are great. Dragon box is a cool learning game. SmarKids games are good, too. About the closed MOOCs I am not so sure, but free online lectures by top researchers — yes please. These are all important when we are aiming to have better education for all. They are, however, not the solution. We need something much more foundational. Education need access to knowledge. This is the classical idea of standing on the shoulders of giants. It is so obvious that we easily forget it. Everything we know comes from somewhere or is build on something. People editing WIkipedia know this. To edit you need sources, you need a library. I am sure that Wikipedia is the most popular open education resource repository in the world. Every student with an Internet connection uses it. To get deeper to some topic, however, you need more than an encyclopedia. You need a library. Internet is the media of the people. Internet Archive is the library of the people. If we think open education, Internet Archive is serving both individuals and educators. With it people can study and discover independently but also find content that will be used in more formal education: from study groups to university classes. The question, is learning taking place online or offline is becoming irrelevant. You do it on- or offline, depending on the situation. The Wikimedia sites, especially Wikipedia, Wikimedia Commons and Wiktionary are extremely important sites for open education. They are part of the foundation. The role of the latest Wikimedia project, Wikidata is growing fast. Wikidata is an infrastructure service for open education. Wikidata is a database with structured data used in the Wikipedia. This means that in the Wikidata there is information that is then used in the Wikipedia articles. If the data (for instance the population of a nation) is changed in the Wikidata it will also change it in all the Wikipedia article replicating the information. This may not sound like a big think, but actually it is. Having the basics facts about our universe in a machine-readable data opens up interesting possibilities for education. First of all, we can easily create various kind of new educational materials and presentations about the world affairs. We may analyze, visualize and study the world. Wen the data is available for all anyone can do this, just like anyone can go to the library. This way Wikidata is serving both individuals and educators. The Wikidata may also bootstrap our common aim of understanding the world. The shared database of basic facts may help us to move forward in the discussion. When we agree on the facts, we may move forward to discuss about the meaning of the facts. (1) Internet Archive could become truly international and multi-lingual. The first step would be to translate the user interface to other languages. Already this would invite people to upload document and content to the site in other languages than English. 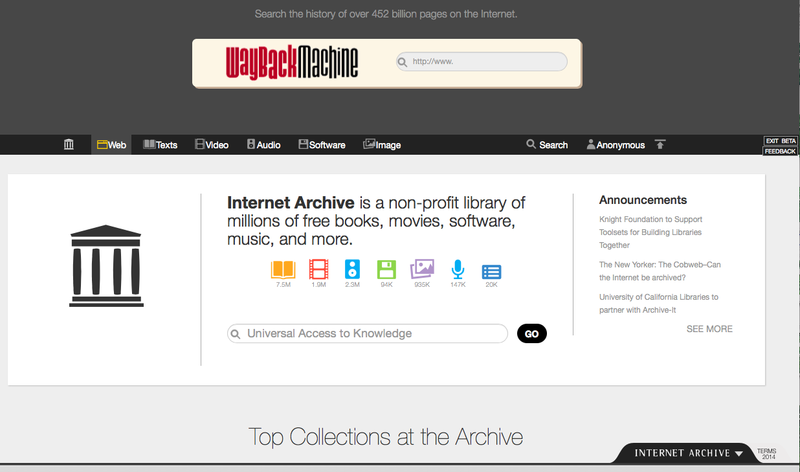 (2) Internet Archive could aim to provide for all a better access to scholarly literature. Currently the situation is terrible. To access the latest research you must have access to University libraries paying for the publishers. The Internet Archive could have a Google Scholar kind of service to open access journals. Wikidata and Internet Archive are both projects funded by people. You may consider donating to support the Internet Archive or Wikidata: Wikimedia Deutschland, developing the Wikidata or the mothership Wikimedia Foundation. Posted in educational tool, Open Source, Sharing economy, Wikimedia, Wikimedia Commons, Wikipedia, Wikiversity, Wiktionary.